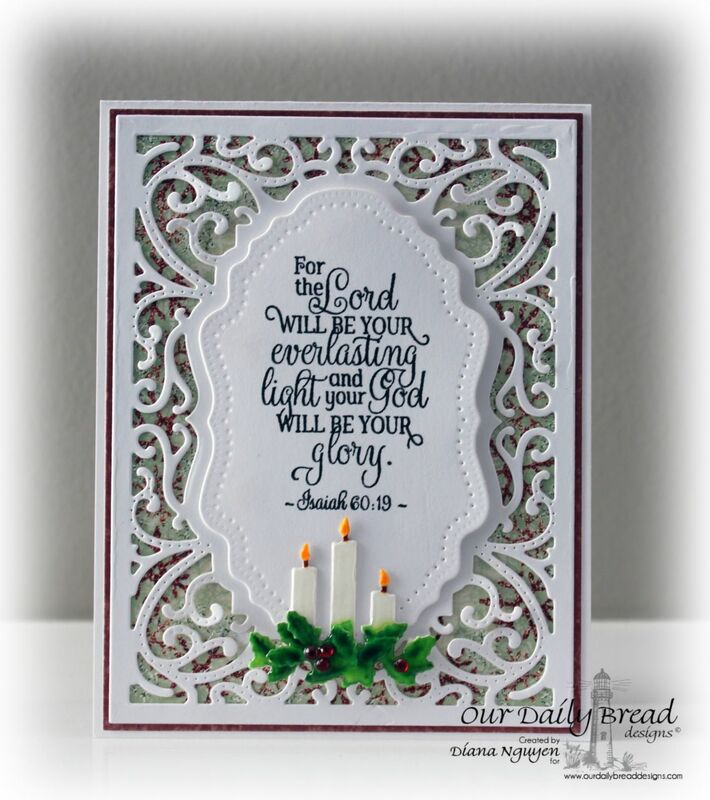 Welcome to Our Daily Bread Designs' October mid-month release! There are lots of pretty Christmas themed products and I'm glad to get a head start on my Christmas cards. 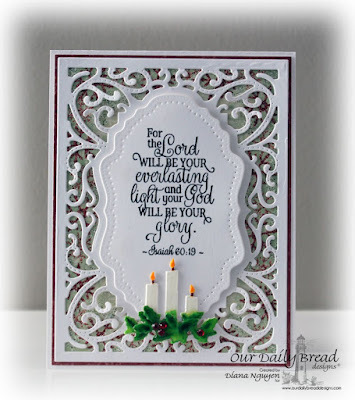 The Everlasting Light stamp set has some great verses that can be used anytime of the year though. 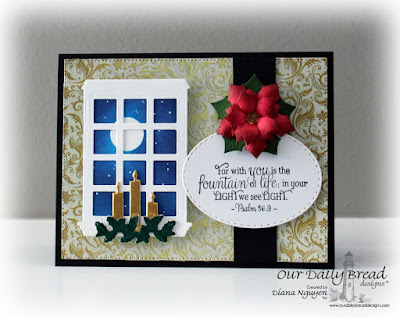 For my first card, I used a verse from the Everlasting Light stamp set against some die cuts from the Vintage Flourish Pattern Dies. The back drop is a sheet from the new paper collection Christmas Card Collection 2015. I also die-cut the Windowsill Candles out of watercolor paper. After I colored it, I added a thick layer of Crystal Effects and some dark red rhinestones. For my second card, I sponged a nighttime scene by masking the moon and adding stars. I trimmed the gorgeous gold sheet from the Christmas Collection 2015 with the pierced rectangle from the Flourished Star Pattern die. The Windowsill Candles were cut out of gold and green metal craft sheets. I also trimmed the verse with the Stitched Ovals and added a Peaceful Poinsettia. Here's a list of all the team on the hop in case you've missed any along the way! You and Angie, are the queen of CAS in my book!! You pull off CAS so elegantly!! I just love the first with all the white and the soft pop of the colors of the candle and the texture!! The second is equally as beautiful with the gorgeous die cut poinsettia!! Love the combo of colors and design! The moon and blue sky really pop through the window!! Gorgeous my friend! Wow! What beauty. I love the nighttime scene through the window. Oh these top two are gorgeous cards!! The last three won't show up for me. :( But I just love these amazing verses and how you've paired them with such pretty dies and images. Two gorgeous CAS designs Diana! I love them both... especially the scene outside your window! Just beautiful, and paired with wonderful verses! OMGOODNESS! Diane these are so beautiful! I love the starry night one so much! Beautiful samples, Diane! I LOVE your window starry night scene!! The first card is lovely. It was the first die I purchased from ODBD. The sentiment is so nice and I love the candles with the holly and berries. The second card........the night scene sponged on is beautiful. Lovely dies, especially the flower. Lovely artwork Diana! Truly creative as well as inspirational! Wow!! Such pretty cards!! The candles are very cute!! The moonlit scene is awesome!! Beautiful cards! The night sky on your window card is stunning! Love your clean and stunning style on the first card, Diana, but the fabulous nighttime sky and pop of red elegance on the second card is absolutely gorgeous, my friend! Hugs! Beautiful, beautiful, beautiful!! Thanks for sharing with us at Word Art Wednesday!! Both cards a beautiful Diana! Love the CAS look of your first card, so elegant. You created an awesome background sky in your second card, well done!!! !